The Rasmussen Reports daily Presidential Tracking Poll for Sunday shows that 24% of the nation's voters Strongly Approve of the way that Barack Obama is performing his role as president. 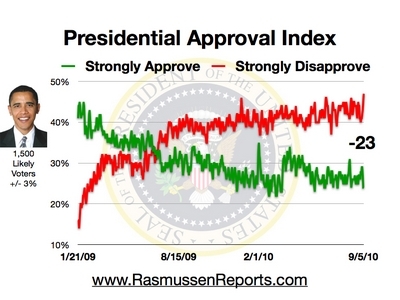 Forty-seven percent (47%) Strongly Disapprove, giving Obama a Presidential Approval Index rating of -23 (see trends). That’s the highest level of Strong Disapproval and the lowest Approval Index daily rating yet recorded for this president. However, while the daily ratings are sometime volatile, a Month-by-Month review of the president’s numbers continues to show a high degree of stability. On a full-month basis, the Presidential Approval Index has stayed between -14 and -17 for eight of the past nine months.